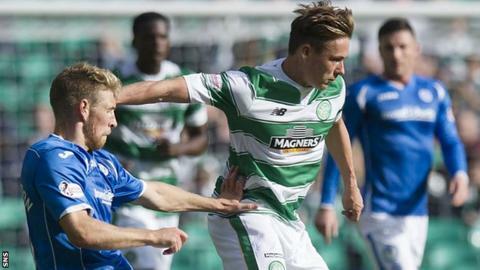 Midfielder Scott Allan says the reaction from fans has not been as bad as he expected since joining Celtic. The one-time signing target of Rangers, the club he supported as a boy, says the comments have been more amusing than alarming. Allan, 23, said: "There's been quite a lot of humour from friends. But I knew it was coming. It's not affected me at all, to be honest. "There's not been any malice in it, so it's been fine for me." The former Hibernian player added: "I've had the odd couple of things said but nothing too bad, nothing menacing. "It's just good to be at a big club." Allan has only played 35 minutes of first-team action since moving from Easter Road to the Scottish champions in August. He has made two substitute appearances against Dundee United and St Johnstone. He believes he needs to bide his time to claim a regular place in the starting line-up and to keep up his match fitness. Last season's PFA Scotland Championship player of the year featured in Celtic's Development League fixture with Dundee on Tuesday evening. "I hadn't played 90 minutes since the first game of the season for Hibs at Dumbarton, so game time is vital for me," Allan admitted. "When I signed I did say I'd need to be patient. I've still had minutes to come on and show, but I need to be patient and wait for my chance. "There are a lot of games coming up so I think everybody will get a chance. It's up to me to take my chance when given it." Those games for the Scottish Premiership leaders include a trip to Pittodrie this Saturday for a lunchtime fixture with second-place Aberdeen, before next Thursday's Europa League group stage opener in Amsterdam against Ajax. He told BBC Scotland: "This match against Aberdeen is probably the biggest game domestically we've had this season. It'll obviously be good to put a marker down. "They try and play the right way. They've got good players and a strong bench which they didn't have in previous seasons. "Aberdeen and Hearts have both started well and I think the two of them will be up challenging this year." With Celtic dropping into the Europa League after failing to qualify for the Champions League, Allan is looking forward to locking horns with Turkish giants Fenerbahce, the Norwegian champions Molde and Ajax in Group A. "The Champions League was a bit of a disappointment, the fact we didn't go through, but there are big European clubs in this group so there are some good fixtures there," he said. "We've just got to get through the group. Fenerbahce have a really strong team, Ajax have been doing well, so hopefully we can give a good account of ourselves and pick up some points. "If we can get some good results first and gain a bit of confidence in the European games then who knows what can happen."